Raven Essential Oil Blend is a cleansing blend of Ravintsara, Peppermint, Eucalyptus Radiata, and other essential oils. 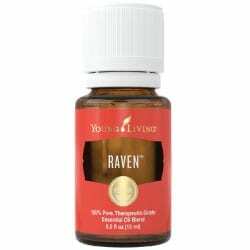 Raven creates a cooling sensation when applied topically to the chest and throat. Display all Young Living Oil Blends online from GF-Oils. Go here. Nothing feels and smells like Young Living Therapeutic Grade Essential Oils. For that reason, insist on them. Are you looking for a specific essential oil? Then you have found the right place. Please Contact us with any questions. First of all, GF-Oils has sold Young Living Essential Oil Products online since 1997. Raven Essential Oil Blend is a combination of deeply soothing therapeutic grade essential oils that will provide comfort when applied topically to the chest and throat or diffused. For aromatic use. Diffuse, apply topically on chest over lungs and throat, put on a pillow at night, use in a suppository application with V-6™ Enhanced Vegetable Oil Complex. Alternate with R.C.™. Possible skin sensitivity. If pregnant or under a doctor’s care, consult your physician. Dilution not required; suitable for all but the most sensitive skin. Do not use on children under age 6. Ingredients: Ravensara (Ravensara aromatica), lemon (Citrus limon), wintergreen (Gaultheria procumbens), peppermint (Mentha piperita) and Eucalyptus radiata.